Northeast Hospital Corp. in Beverly was recently cited by the U.S. Department of Labor’s Occupational Safety and Health Administration (OSHA) for alleged violations of electrical safety standards. OSHA was alerted to the issues by a complaint from a worker. Proposed fines for repeat and serious violations would be $63,000. Our Massachusetts workers’ compensation attorneys understand the extreme dangers and devastating injuries caused by electricity. Inspectors found employees changing circuit breakers on live electrical panels. This is extremely dangerous and exposes the workers to the risk of arc flash incidents, burns, electric shock and electrocution. While working on live electrical panel’s employees either did not use or lacked personal protective equipment. Other issues found included a lack of consistent testing of electrical protective equipment; work practices related to electrical safety were not used; and no specific plans were in place for controlling electric current while replacing electrical breakers. Four serious citations were issued following the inspection, resulting in $28,000 in fines. Serious citations are issued by OSHA when there is substantial risk of serious physical harm or death from hazards that the employer knew or should have known about. One repeat citation was issued with a fine of $35,000 for not closing unused openings in cabinet motor control centers and electrical panels. The hospital was previously cited for this same issue during a May 2010 inspection. A facility receives a repeat citation if they have been cited for the same violation in the last five years. -Electrical burns occur, usually to the hand, when electric current passes through or goes near your body. -Arc burns occur from an electric arc, which is when a very strong electric current jumps from a gap in a circuit. 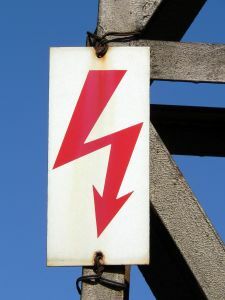 An example of an electric arc occurs in welding and an extreme example is lightning. The extreme heat from the arc causes the burn. -Thermal contact burns are caused from extreme heat or fire from malfunctioning electrical equipment. If you have been injured on the job in Massachusetts contact the Law Offices of Jeffrey S. Glassman for assistance. Call today for a free appointment to discuss your rights at 1-877-617-5333.